It is my intention, Sir, to make reference to some of these matters to demonstrate what was stated in this Parliament and by others, at the time the conflict took place without any contradiction by the Government. I will read, Sir, from the position that I stated in Parliament in 21st January 2009. That was the position in this area when I spoke in this Parliament in January 2009, a position which was not contradicted by the Government. The reason why I am reminding the House of these matters is that you cannot sweep everything under the carpet. Your current approach can do immense harm to this country. Much has been said about the fact that there is a complaint that 40,000 people have been killed and as to how that can be accepted. There were at least 350,000 people in this area, probably around 400,000 based on our own investigations, only 290,000 people came out. What happened to the balance? Your estimate was that there were only 60,000 to 70,000 people who lived in this area at this point in time. You sent food, medicine and other supplies only for that number – 60,000 or 70,000. When the number was as large as 350,000 why did you restrict the number to only 60,000 or 70,000? I want to make it very clear, Sir, that no one is saying that all the Armed Forces who fought the LTTE on the instructions of the Sri Lankan State should be blamed or punished. The Armed Forces acted on the instructions of the Sri Lankan Government, but those responsible for domestic and international crimes including those responsible on the basis of command responsibility and the chain of command should not be allowed to get away scot-free. I say this because that would be extremely harmful to the future interests of this country, the long-term interests of this country. It is absolutely essential, Sir, that the truth must be ascertained. The second matter I referred to was the Constitution. We all adopted a Resolution in this Parliament unanimously to frame a new Constitution, but we seem stuck. I do not know why, but we seem stuck. I want to refer, Sir, to something which President Barack Obama, the first black American President said shortly after he was elected as the President for the first time in the United States. He said, “The American people must be true to our founding documents, the documents on which America came into being. American people must be true to their founding documents, the document on which America came into being.” Do we, in Sri Lanka, have any founding document, any Constitution to which we can go back and say, “This is our founding document; this is the document on which the country is built, our society is built, which we cherish, which we value, which is the ultimate law of the land? Do we have any such founding document? How can we survive as a nation? How can we survive as a country, when we do not have in this country a constitution which has been accepted by the majority of the people in this country based upon a consensus as much as possible a national consensus? And, this Parliament adopted a unanimous Resolution to frame a new Constitution. Much work has been done in regard to that matter, in fact, the constitutional process has been going on from 1988 for almost 30 years. There was a “Mangala-Moonesinghe Select Committee Report during President Premadasa’s time; there was a Madam Chandrika Bandaranaike’s Report during her term as President- August 2000 Constitutional Proposals; there was a proposal made by President Mahinda Rajapaksa, the Tissa Vitharana Report – the APRC Report. With all these being available to us, we are still unable to frame a Constitution. And, do you think, that is a good thing for the country? Is it good for the country to go on like this? Can you go on like this indefinitely? Is it not harmful to the country? In regard to the national question, Sir, your position appears to be that you have brought about a military solution and there is no need for a political solution now. If you cannot keep the people contented, if you cannot give the people their legitimate rights, then, the sustainability of your unity and your territorial integrity become gravely questionable. Are we not in the same state? How long has the Tamil question remained unresolved? For the last 70 years? And the Constitutional process that we started in 1988 – we are today in 2019 – 30 years down the road. – has not yet been completed and you are unable to complete it. We do not know what is happening. 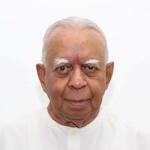 You do not have the will to complete the process and you want to keep the Tamil people as second-class citizens and you want to suppress them militarily even if they were to rise again. Through civil disobedience based upon ahimsa and sathyagraha, you think they can be suppressed. More than 50 per cent of the Tamil population who lived in this country have left this country. Is it your belief that if you proceed with your military course of action even the balance 50 per cent would leave? Is that your position? Is that your thinking? We are committed to a solution within the framework of a united, undivided, indivisible Sri Lanka. We are firmly committed in regard to that. We want to evolve a solution within the framework of a united, undivided, indivisible Sri Lanka. But, if you do not accept that, please do not expect us to live in this country as second-class citizens. We will not live in this country as second-class citizens. We have our own sovereignty to which we will be entitled. In that situation, on account of your lapse, on account of your default to ensure that we are able to exercise our sovereignty within a united country, you will create a situation harmful to the country. Hon. Minister, when we met you, you assured us that you will transfer Rs. 5 billion this year for the commencement of development activities in the North- East. We have eight districts in the North-East. I do not have to give you the names. The Prime Minister started a mechanism under his chairmanship; coordinators have been appointed; they have consulted our people; they have consulted us and come up with proposals. Each district has come up with proposals up to about Rs. 3 billion. We need in all for a start Rs. 24 billion. We are not demanding the whole thing now. But, kindly give us a substantial percentage, at least 60 or 70 per cent of the Rs. 24 billion, to be able to commence the activities that must be given priority, to ensure that we are able to carry on those activities and to have them fully implemented. I have not the slightest doubt that you will be very sympathetic and very understanding in regard to my request. I would urge you to kindly discuss this matter with the Prime Minister. After all, Jaffna is an important district, a peninsula; there is the Vanni; there is the Eastern Province which is a large area, comprising of Trincomalee, Batticaloa and Ampara where all people have suffered. Tamil people, in particular, have suffered a great deal. There is much development that is urgently required, particularly, in agriculture, fisheries, livestock development, industries and employment. Women, widows, ex-militants and ex-LTTE cadres who have come back to civilian life need to be looked after. All these things cannot be done if there is no money. We are formulating programmes so that we will be able to deal with these issues expeditiously. That is necessary. There is no purpose in talking about national reconciliation and there is no purpose in talking about goodwill and harmony unless you are able to make a contribution to uplift these people and to improve the standard of living of these people. That is what we are asking for.